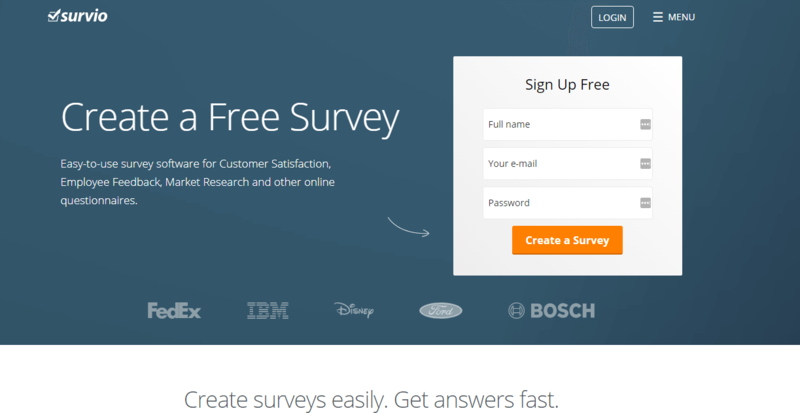 Survio is a simple and user-friendly online survey software that creates online surveys for market research, customer satisfaction, event promotions, academic progress tracking and much more. It also assists in HR management by doing core surveys like accessing employee performances, screening potential candidates, collecting employee feedbacks etc, which enables businesses to make better decisions. With its rich feature set and survey templates, it provides with an effective solution for preparing questionnaires, collecting data and result analysing, sharing & exporting. Moreover, the surveys can be seamlessly adapted to any smartphones and tablets, allowing you to reach out effectively. How much does Survio cost ? The pricing for Survio starts at $14.08 per month. Survio has 3 different plans such as - Personal at $14.08 per month, Business at $24.92 per month and Elite at $58.25 per month. 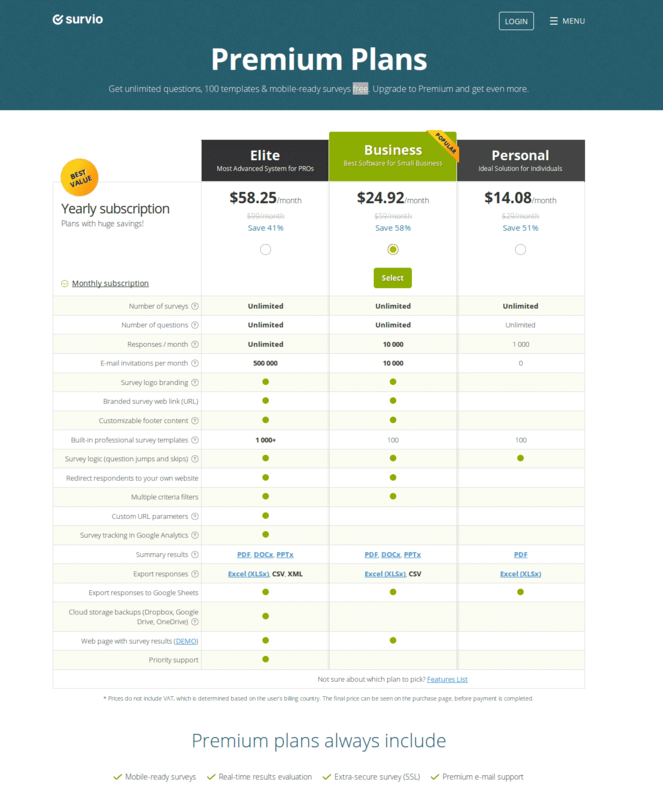 Survio offers a Free Plan with limited features. They also offer an Enterprise Plan for their product. "A very useful service, but a bit too expensive." It's very easy to use. The data export to excel is very useful. It's a bit too expensive, especially for ourselves, a non profit organization. We are conducting surveys between the italian heltcare providers, to improve treatment of patient affected with rare diseases. Very useful fo our job. Bit too expensive tough. Pros: Very easy to use. Exports data to excel. Cons: It's a bit too expensive, especially for a non profit organization. "Intuitive, user friendly, effective, and exceeds expectations"
The design is superb, easy to navigate and very user friendly. Using this platform for the first time, I was left feeling confident in the results and pleased by the service. The gathering and evaluation of responses was spectacular, and I particularly liked the graphs in illustrating my results. I dont have much to say here, I usually dislike online internet services preferring more personal interactions but I walked away without any complaints or concerns! High quality and very competitive product, easy to use and delivers the required results. Any trouble, the support team is always at hand and happy to assist! I was looking into what common issues my colleagues are experiencing in their customer facing dialogues. I wanted to analyse trends and recurring concerns so that we as a team could more effectively combat them. "Easy to use and great value for affordable price"
I appreciated that the Survio system is very straightforward and easy to understand. The customer support is just excellent. Limit of responses in the free version is just 100, but the responses keep collecting regardless the type of service and will open after you pay for premium type of service. Take your time and read the terms and conditions. Survio does not hide any info, but you need to be aware of the terms. Easy way to collect info about our customers satisfaction, we even use automated reminders when inviting our respondents to answer the survey. Overall: As a student, survio is a useful helper for me during my studies. Cons: After creating and sharing a survey i had 80 responds to my survey, when i decided to analyse my data i was asked to pay in order to retrieve the usable data. Witch they forgot to make clear in advance. My situation now is that i am forced to buy in to a subscription in order to retrieve my data. And when they offered to give me an 20 percent discount on the costs because i am a student, I must first write 3 reviews on various websites. Of course i cannot redo a survey, because that would lead to different results. Otherwise i would have used Google forms, this is free and has the same functions. Overall: Bad, my data is taken hostage by survio. Overall: I am solving reasearch of my PhD studies. Pros: Easy to use, great technical support, various types of questions enable user to make really relevant questionnaire. Cons: Some of the types of questions coul be more "sophisticated". It would be useful if "no answer" in one question could automatically redirect the questionnaire to selected question. Overall: Survio made my work easier - happy to use it!